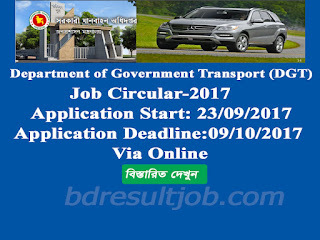 Department of Government Transport (DGT) of Bangladesh Job circular has been published on www.dgt.gov.bd. According to the recruitment notification, they will appoint a total of 280 vacancies in terms of Drivers. Eligiible and interested application can apply online and application fee pay by Teletalk. Department of Government Transport (DGT) of Bangladesh Job circular for the post of Driver. 7. Candidates must be Bangladeshi by born. b. Heavy and light Driving Valid License. c. Experience will be given preference. a. Visit: http://dgt.teletalk.com.bd/home.php and Select your position. b. Required application form fulup carefuly. c. Click next step and see preveiw your appliaction and check your appliation carefuly. f. Print the applicant copy A4 size paper and complete payment in Teletalk SMS. Reply: Applicant’s Name, BDT. 100/50 will be charged as application fee. Your PIN is (8 digit number). DGT authority will be notify by SMS your mobile phone when ready your Admit Card. You can login your User Id and Password and download Admit Card from http://dgt.teletalk.com.bd/home.php. Your Admit Card all information are mentioned Examination Date, Time, Venue and Details seat location. You can visit DGT Official website for further information. After examination DGT authority will published as soon as possible exam result. You may visit DGT Official Website www.dgt.gov.bd or http://dgt.teletalk.com.bd/home.php. Tags: dgt teletalk com bd, www dgt gov bd, Department of Government Transport (DGT) Job Circular 2017, Department of Government Transport (DGT) Admit Card Download, Department of Government Transport (DGT) Exam Result 2017, Department of DGT Admit Card Download, DGT Exam Result 2017. 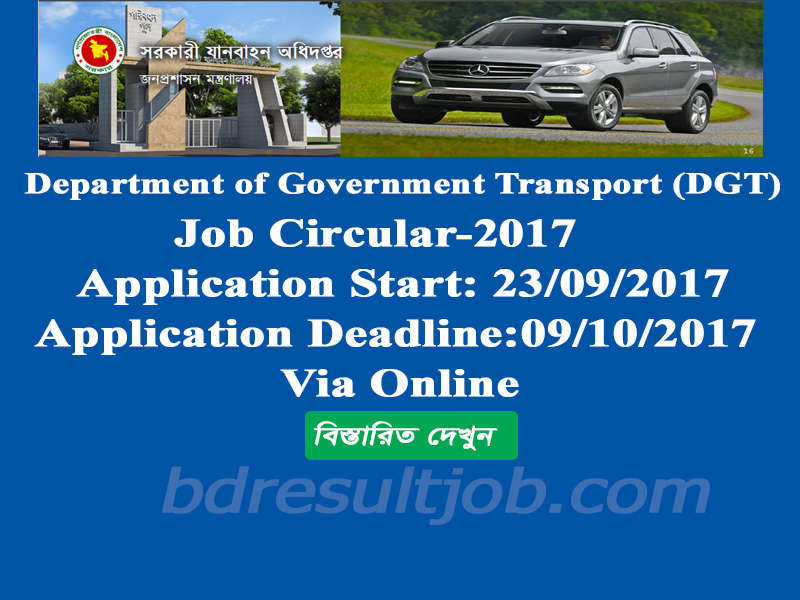 Department of Government Transport (DGT) of Bangladesh Driver job circular 2017, Department of Government Transport (DGT) Admit Card Download, Department of Government Transport (DGT) Exam Result 2017, Department of DGT Admit Card Download, DGT Exam Result 2017.